On April 13th, Chicago Booth held its 7th Annual Distressed Investing and Restructuring Conference. The organizers of the event have graciously provided us extensive notes for the conference which we've laid out below. I heard it was an amazing event from many readers. Enjoy! Mr. Grant began by addressing Ben Bernanke’s March 20, 2012 lecture at George Washington, where the Federal Reserve Chairman blasted the Gold Standard. Mr. Grant expressed his thoughts that Distressed Investors were likely a much better group to efficiently allocate capital to the Banking Sector during the crisis than was the Federal Government. However, in a pinch, there is very little the Fed will not do to “save” us as illustrated by the $2 Trillion dollars it created out of thin air. Bernanke’s Fed has defined price stability as a positive rate of inflation; less than 2% would be deflation. Mr. Grant pointed out that if Bernanke is a historian he is not the kind that reads and writes history. Milton Friedman, in his study of the last quarter of the 19th century, showed that price levels decreased between 1 and 1.5% while the economy experienced the greater technological advancements than any previous 25 year period in history. Nevertheless, Bernanke seams unaware of the benefits of creative destruction and bargains (value/distressed investment opportunities). Mr. Grant illustrated this point (Creative Destruction) by referencing the opening of the Suez Canal, which caused certain economist in London to wonder if they should have filled “the thing” up with dirt as it rendered storage related segments of the London economy irrelevant. Continuing his point on how the Federal Government allocated capital differently than a distressed investor would have, Mr. Grant mentioned that during the last quarter of 2008 TALF lent money at a rate of 1% during the same time period that banks were lending to each other at 3.5%; Morgan Stanley borrowed $100+ billion, which was much higher than its market cap. Mr. Grant is convinced that the Fed (Ben Bernanke) does not fully understand the markets or the crisis. The statement that “the only solution is for regulators to monitor all financial institutions” is horrible; historically banks did not only take risks but they bore those risks as well. Mr. Grant’s final comments addressed the possible consequences of suppressed interest rates as he expressed his believe that Bernanke is wearing interest rate “Beer Goggles”. He likened the current regulatory situation to the Seaman’s Act of March 1915, which set new requirements for lifeboats and was drafted in reaction to the Titanic disaster. On July 24, 1915 the SS Eastland, a passenger ship, due to the additional weight burden of the Seaman’s Act mandated lifeboats, rolled over while tied to a dock in the Chicago River killing 844 passengers and crew members. Our new crisis engendered policy response financial regulations will have negative consequences. Similar to the Seaman’s Act of 1915, the risks associated with these regulations were not incorporated in the thought processes that ultimately lead to their creation. After a court’s decision on the value of a claim, the creditor may still receive more than the ruling amount in the event of an asset sell. Credit bidding, the ability for a creditor to bid their debt with their cash alongside bidders that only bid cash, may be eliminated by the courts; 7th Circuit River Road Hotel case. Panel Consensus -> Credit bidding should remain an option as: an all cash bid may not be possible for a cash strapped firm, bidders have the right to finance however they would like (credit bidding is self-financing), creditor syndicates have mixed financial backgrounds and should have financial flexibility to better coordinate, government entities may have no other way to bid due to the inability to raise fund. In regards to the bidding structure, Judge Wedoff discussed the issue of eliminating some of the bidders from the auction. However, doing this would create a non-market price. There are contracts that allow all parties to trade after the fact as they demand that the firm publically release all information that the insiders had access to during the restructuring/stressed situation. Some firms have come in and out of blackout periods to trade. However, judicial decisions indicate judges’ inpatients with investors who have done this. Also, firms with the same information have made very different (sometimes offsetting) investment decisions signaling that insider information may not always provide an investing edge. Some firms have chosen to hire a trusted third party to act on their behalf’s so they may remain able to trade the name in the market. One panelist expressed doubt in this solution due to its potential principal/agent issues. When you have a regulatory asset that cannot be sold, can you use the economic benefits associated with those assets (licenses)? FCC licenses cannot be sold. However, a lien can be levered on the income that can be generated from the license. As a firm cannot pledge the license the question is can a firm pledge the proceeds associated with the license? A case in Colorado concerning an FM station received a court ruling of “no” to the question citing that (1) the license has not been sold and (2) all licenses must be approved by the FCC. One panelist vocalized the believe that the Colorado Court should have ruled differently and cited joint venture corporations that have similar structures and economics (Southern District of New York upheld this argument). Judge Wedoff believes that in such a scenario you would not be able to enforce the lien. However, the world loves “work-arounds” and in reality licenses can be placed in SPVs that can than pledge the economic value. Can Slots (the right to take off and land during certain times), Gates (where passangers board and un-board), and Routes (flight paths into airports, which are limited) be pledged as assets? Bonds have been issued that were secured by Slots, Gates, and Routes. The American Airline Case will eventually tell us if they can be posted as collateral. However, as one panelist stated, gates are likely a canard while slots and routes may be ruled as regulatory licenses (proceeds may be pledged but not the licenses). Distressed investors should constantly run their decision trees to located and evaluate potential opportunities. Distressed companies and distressed sellers provide compelling opportunities. A retailer CFO stated “the availability of money is more important than the cost of money”. This means high returns may be extracted from supplying liquidity to an illiquid situation. Firms that never go bankrupt can provide compelling investments; bank debt (leverage loans) outperformed junior debt during the recession. An investors decision trees should include the following questions: how healthy is the industry, does anyone care if the company disappears. Ask yourself what must you as an investor need to believe; will anyone care about the displaced industry (horse buggies) when new technologies are introduced to the market (Ford’s Model T)? Why do firms go bankrupt? (1) liquidity crisis (but good company),(2) insolvent (bad capital structure with viable business model), (3) unviable (bad business model). Typically defaults peak 18 to 30 months after peak issuance. The biggest mistake a distressed investor can make is assuming that tomorrow the world will be like it was yesterday. Tomorrow the world may be as it was 10 years ago or it could be in a state we have never seen before. ETF’s may provide fire sell opportunities. Global macro factors, such as Chinese inflation, may provide opportunities as well. If Chinese labor prices rise while our income is fixed, higher prices at Walmart would mean we are importing Chinese inflation, which could engender distressed opportunities. Sankaty is looking at what the elections in the US & France (and elsewhere), sovereign balance sheet leverage, commodity price increase (oil, gold, etc), financial oppression, and the drop in natural gas prices may do to asset valuations. Terra Star was formed to take advantage of terrestrial networks by filing the gaps of land line based cell coverage. After bankruptcy the strategy was to hold its FCC license for as long as possible as it would likely have significant value. An auction was executed with 75 non-disclosure agreements sent out to extract the most value from the asset. However, only 3 non-disclosure agreements were returned signed. The auction was a naked auction (no leader to provide a starting bid amount), which can lead to very small bid amounts. In this case, the result was a successful bid of 22 cents on the dollar for assets that proved to be worth roughly 60 cents. Thus, the return was ultimately about 300%. Collective action proved difficult in this case due to the classic problem of concentrated benefits and defused costs. At the end of the day, only one company was willing to put up the money and was rewarded handsomely. Bankruptcy court damages businesses, is costly, and very contentious. However, to resolve the issues out of court you need 100% consent and many times you will have a hold out problem. Pre-packaged bankruptcy is fully negotiated and is documented whereas a pre-negotiated deal does not solicit votes. Every year since the onset of the financial crisis there has been an increase in pre-packaged bankruptcies, while restructurings have trended down. The substitution away from full restructuring is in large part due to time constraints and the interruptions restructurings force onto businesses. Chapter 11 equates to spending a lot of money and to conserve value and prevent a bankruptcy free fall it is better to avoid this scenario. However, in a constrained DIP situation the bank controls everything and liquidity is not available for middle markets companies due to Dodd-Frank. A good business with a bad capital structure is a strong candidate for a pre-packaged deal. However, a pre-packaged bankruptcy may take two months so if you are cash strapped you may not be able to afford this option. The success of any deal depends heavily on intrapersonal skills, ensuring that participants actually own the bonds and have the power to make the deal. No party wants to receive the worst deal and everyone wants the best deal while no insider information may be used to make the deal (if the deal sours all information must be made public). Loan to own investors may be good for situations where time is very valuable as they will get things done, which protects against a bankruptcy free fall. However, these investors do not always maximize value. Each member of the panel presented a specific distressed investment example that their respective firm’s participated (is participating) in. The discussion included a broad walk through of these investments with focus on the key issues associated with each opportunity. An electric generation company in Boston was discussed broadly with an emphasis on a few points. Predicting the fulcrum security is crucial as is avoiding the loss (management selling) of assets that are crucial to post distressed value realization. A national moving company was also discussed. The company had an interesting dynamic in that it also provided executive relocations services, which included home sells. These homes were being put back to the company in significant numbers due to a lack of enforcements of agreements that would have dramatically reduced the number of company owned homes on the balance sheet. Systematically reducing the number of homes on the balance sheet through agreement enforcement meaningfully improved the firm’s credit profile as did other operational and procedural changes. The panel was optimistic about continued opportunities in the distressed space but insisted that relationships and the ability to move into different sectors when necessary is crucial to gaining access to the most attractive deals. On April 23rd, the Supreme Court (SCOTUS) heard oral arguments on the issue of credit bidding that has been discussed on Distressed Debt Investing a number of times: Credit Bidding and the Supreme Court and Advanced Distressed Debt Lessons: Credit Bidding. Credit bidding is relevant to distressed debt investors for a number of reasons and can swing who gets what (most importantly, the fulcrum security) in a Chapter 11 proceeding. With the contrary rulings in the Seventh Circuit as compared to the Fifth Circuit and Third Circuit (probably the most famous for distressed investors: Philly News), it was a matter of time before SCOTUS took the issue up. Some have called this the most important business bankruptcy case in nearly 15 years. The case at issue specifically in from of the Court is RadLax Gateway Hotel, LLC v Amalgamated Bank. In the case the Seventh Circuit ruled with Amalgamated Bank that River Road bankruptcy case (Northern District of Illinois) could not be confirmed because it did not allow Amalgamated Bank to credit bid its claim. River Road argued that because Amalgamated Bank was receiving "indubitable equivalent" value of its collateral (a term not defined in the code) it did not need to be allowed to credit bid. The bankruptcy court shot this down quickly. The Debtors appealed and the Seventh Circuit ruled with the bankruptcy court, specifically pointing out in their ruling they disagreed with the rulings in the Fifth and Third Circuit. For those that do not know, an amicus brief is information offered to the court by a non-party in the case. For the SCOTUS hearing, an amicus brief was filed, in support of the secured creditor's position (i.e credit bidding should be allowed), by an impressive group including the LSTA, the American Bankers Association, Mortgage Banks Association, to just to name a few. In addition, the United States filed an amicus brief in support of lenders position. A favorite point of mine in the United State's amicus brief: "
The ability of a federal agency to bid cash is therefore strictly circumscribed by the scope of its congressional appropriation. But because federal law also requires the United States to take a lien on collateral when it extends certain kinds of loans, the United States is often a secured creditor in bankruptcy proceedings...If the United States and federal agencies are unable to bid cash at the sale of their collateral due to a lack of appropriated funds, and are prevented from exercising their statutory right to credit bid, the auction price of such asset would be depressed, and the United States would ultimately receive less value for its security interests"
"The Loan Syndications and Trading Association, joined by nine other trade associations, submitted an amicus brief to the US Supreme Court in the RadLAX Gateway Hotel case, arguing that secured creditors cannot be prevented from “credit bidding” in an auction of their collateral in a “cram down” plan of reorganization. The LSTA argues that credit bidding is a critical tool for protecting a secured creditor from having its collateral undervalued. If the creditor is not satisfied with the competing bids, it can obtain the property by bidding more, using the amount of its unpaid debt as currency in the auction. "In this case, the debtors are attempting to steer the collateral to a bidder with insider ties at a substantial discount at the expense of the secured creditor," commented Elliot Ganz, Executive Vice President and General Counsel of the LSTA. "The Bank-ruptcy Code is specifically designed to prevent this type of mischief and ensure that secured creditors get the value they are entitled to receive." While its always hard to tell which way the court will rule, the transcript reads like SCOTUS is leaning towards the lenders position, with debtors counsel taking a bit of a flaying by most of the 8 judges present (Kennedy had recused himself). A world without credit bidding would completely flip upside down what I had been taught to view bankruptcy (i.e. loan to own works because the credit bid has significant leveraging power) and distressed investing. If I had to make a bet, I'd say that management teams of Chapter 11 debtors would rather not have credit bids: i.e. you create the equity at a lower valuation (all else being equal) because lenders will rarely cash bid anywhere near their credit bid (good money after bad). I'd expect we'd hear back soon from SCOTUS on the case. This has been a fascinating one to watch over the past few years. On April 5th, 2012, President Obama signed the Jumpstart Our Business Startups (JOBS) Act into law. In my opinion, this may be one of the most important pieces of legislation enacted in the past 20 years. And investors of all sorts: angels, value, distressed, etc., should be paying attention. Crowdfunding: Companies will now be able to raise up to $1 million dollars a year in small increments from a large pool of investors. Crowdfunding is nothing new: If you have ever heard of Kickstarter or Indiegogo, you know what I am talking about. People have been contributing small amounts of money to many causes over the past few years. But never before were you allowed to offer equity in exchange for the capital received. Crowdfunding in exchange for equity will turn the current channels of crowdfunding and angel investing upside down, and will provide enormous opportunities for professional investors and entrepreneurs alike. In 90 days from enactment of the legislation, the general solicitation ban will be removed, and in 270 days, crowdfunding in exchange for equity will begin across this country. I cannot contain my enthusiasm for the JOBS Act. I hope this post will show you why. In the middle of 2010, a friend of mine who is involved in the angel investing community here in New York forwarded me a petition that was being sent to the SEC to allow for small sums of money to be raised in exchange for equity from a large group of investors. At this point, Kickstarter was a raging success and was getting more and more press for the size of deals going through the site. The backers of the petition called it the "Crowdfunding Exemption." Up to this point, the SEC was staunchly against crowdfunding in exchange for equity (and arguably still is). Expert testimony was heard in Congress in the middle of 2011. People really started to take notice in September 2011 when the White House announced the President's Start America Initiative, which would change current regulation to allow for crowdfunding among other things that eventually ended up in the JOBS Act. HR 2930, the "Entrepreneur Access to Capital Act" was passed in November 2011 with bipartisan and White House support. Eventually, and with a real push from Senator Scott Brown in Massachusetts, the Senate, after many revisions, committees, and testimony pushed through version of the crowdfunding bill. The final bill, which stemmed from HR 2930, with amendments from the Senate passed in late March 2012. Previously, the SEC has emphasized that there is a pre-existing relationship with potential investors. For anyone that has filled out an accredited investor survey, this is one of the ways in which funds historically have developed this "pre-existing" relationship. Furthermore one of the reasons that 99% of funds out there have password protected sections is to ensure that these funds aren't soliciting investors in violation of Rule 502(c). Under the new legislation, within 90 days of enactment (so call it in a little less than 80 days), the SEC must change the rules of Rule 506 private placements to allow for general solicitation through any medium. A caveat here is that all ultimate purchasers must be accredited investors. If I wanted to raise a fund, I could take out an ad on CNBC, or put up banner ads across the internet, or take out a ad in the WSJ or New York Times. As long as my ultimate purchasers are accredited, I am good to go. The SEC is also required the eliminate the prohibitions on solicitation for Rule 144a securities. There are so many implications to this that it would take pages and pages of text. The possibilities and opportunities are endless. Information is going to flow so much more fluidly, which I think is a good thing. While there still may be some reasons to limit general solicitation (i.e. keep your investors small and strategic), a small fund that has amazing results will be able to broadly communicate their success with the public at large. Larger funds with deep marketing teams have historically had the advantage just by owning the channels to the accredited community. Now those channels are being torn wide open. And the change to operating companies is simply fantastic. This is Shark Tank on steroids (fantastic show). If I have a great business idea, and needed capital, historically I could go to friends and family (pre-existing relationships) or possibly something like AngelList or Gust if I had any idea about the angel investment community. Now the opportunity for possible lucrative investments will not be held in the clutches of those just in the know. Furthermore, if opens up potential "vertically integrated" investments from strategics on Day 1. If I have built an application that is targeted to help retailers sell their product, why not go right to the retailers to raise capital? You might even get acquired right from the get-go. And you have to think that hedge funds will have public presences on the internet, with letters, performance, and marketing materials for all the world to see. As one would expect, the key criticism opponents to the bill bring up is the risk of fraud. I have no doubt that "fly by night" schemes will increase. But given that the ultimate purchasers will be accredited and in theory qualified, the positives here massively outweigh the negatives. I do expect an entire new cottage industry to develop that will serve as a combination of forensic as well as private investigator on the fund managers and entrepreneurs to eliminate as much fraud as possible. The second item in the legislation that I am excited about is crowdfunding. By amending Section 4 of the Securities Act, a new registration exemption will emerge in crowdfunding. In the past, the Kickstarters of the world (there are hundreds) allowed people to raise money from individuals in exchange for everything BUT equity. The JOBS Act does away with this, and now individual investors (they do not have to be accredited) can fund projects and start ups in exchange for equity. As one would expect there are many stipulations in the legislation to protect the general investing public: For example, individuals with incomes or net worth less than $100,000 will only be able to invest a few thousand dollars annually. For other investors, the amount is the lesser of $100,000 or 10% of an investor's annual income. The capital will be raised through what the SEC is calling "funding portals" which will have to register with the SEC in order to facilitate crowdfunding. There are many more stipulation on the companies raising the money. The max capital that can be raised each year is $1,000,000, and that's only if you have fully audited financials (you can raise $100,000 with the CEO signing off and $500,000 with a CPA signing off). In addition, there are informational disclosure requirements including names of holders of more than 20% of the shares, names of officers and directors, and a description of the business plan. Crowdfunding issuers cannot advertise their offerings except to direct potential investors to the crowdfunding platform for specific terms. This will allow the SEC to maintain a close watch on the crowdfunding market (i.e. through portals versus non registered offerings). A liability provision has been put in place in the legislation that, in my opinion, is probably the worst piece of the legislation. Any purchaser buying these securities can bring a lawsuit against the company raising capital and will be returned his/her capital if there were material misstatements or omissions in the crowdfunding document offerings. I wish this were changed (i.e. Why wouldn't I always sue in the investment failed?) but I understand the reason it was included. If you purchase one of these securities (it doesn't just have to be equity), you will be required to hold it for one year, though you will be able to transfer the security back to the issuer or to accredited investors. To me, this means SecondMarket is going to be absolutely killing it - they are the All Stars of trading private companies' equities and I think this will just bolster their offering. Even with SecondMarket, I truly believe there will be MASSIVE amounts of inefficiencies in the secondary market that an astute investor should be able to capitalize on. Until now, very few people were able to get in at the ground level for lucrative venture investments. I think this opens it up dramatically and benefits both investors and entrepreneurs. Many people in the angel and venture capital community DO NOT like this legislation since it stomps all over their turf / playground. Now skilled investors will have a fair shake and look at many different sorts of investments that they would otherwise never have seen. Some companies will still choose to go the traditional angel / venture capital route as it offers many strategic/advice/mentoring/connection advantages. But I think crowdfunding will turn the angel and venture capital world upside down. The SEC has a 270 day review period to make sure all the rules / regulations / systems are ready for crowdfunding. I'd expect the first capital raises to begin on January 1st, 2013. This bill will completely change capital raising in this country. It will allow more entrepreneurs to raise capital and create jobs than every before. It will allow more investors to participate in the upside for start up and high growth companies than ever before. It will create significant inefficiencies in the marketplace that I think discerning value investors can take advantage of. While I did not get to the other aspects of the bill, after reading them a number of times, they are just as exciting as the two mentioned above. I will probably do a summary post on it in the near future. I hope the investing blogosphere starts spending more time on the JOBS Act. I am trying to get myself involved in as many ways possible, from advising start-ups, to providing services to companies thinking about crowdfunding, to getting ready to personally invest through the crowdfunding platform, and finally to eventually raise capital through one of these channels. If you'd like to know more about the work I'm doing or want to get involved, please contact me. I've said this to many people in the past few weeks: This is our gold rush. And I couldn't be more excited. Today, Reddy Ice (RDDY or "the Company") filed for bankruptcy in the Northern District of Texas (Dallas). It was revealed in the press release that the company had secured a $70M DIP and $50M in exit financing with a plan supported by "the majority of the principal amount of First Lien Notes, Second Lien Notes, and Discount Notes." The docket can be found here: Reddy Ice Docket. For reference, at the close, Reddy Ice's 11.25% were trading 91-92 (with accrued) and the 13.25% were trading at 15-17 (flat). The company has filed its Plan of Reorg and Disclosure Statement. But first, let's take a peak at the Declaration of Steve Janusek, CFO of Reddy Ice, in support of bankruptcy petition and first day motions (Docket #27). Reddy Ice is the largest manufacturer and distributor of packaged ice in the United States. They are the ones that make and sell the bags of ice at super markets and convenience stores. In 2011, the Company sold 1.7 million tons of ice with a particular geographic focus in the southern United States (this is important for reasons to come later). Please note: That according to Docket 21: "As of the Petition Date, the Company owed approximately $50 million plus interest, fees and expenses, and had no availability, under the Prepetition Credit Agreement." In addition to addressing the Company’s declining EBITDA and current debt, the Restructuring is also intended to provide the Company with the opportunity to pursue a strategic acquisition (the “Strategic Acquisition”) of all or substantially all of the businesses and assets of Arctic Glacier Income Fund and its subsidiaries (“Arctic”). As is the case with the Company’s business, Arctic has encountered financial difficulties due to adverse trends in our industry in recent years. On February 22, 2012, Arctic filed for protection under the Companies’ Creditors Arrangement Act in Canada and Chapter 15 of the Bankruptcy Code in the United States. Arctic has initiated a Sale and Investor Solicitation Process (“SISP”). The purpose of the SISP is to seek sale proposals and investment proposals from qualified bidders and to implement one or a combination of them in respect of Arctic’s property and business. commitments for debt and equity financing for the acquisition. Centerbridge has indicated its interest in providing the entire amount of the equity financing for the Arctic acquisition. Arctic Glacier (symbol: AGUNF) bankruptcy proceedings in Canada can be found here: Arctic Glacier CCAA Proceedings. For full disclosure, I am long AGUNF and I will explain why shortly. The rest of the support filing goes on to talk about the proposed restructuring which is highly dependent on whether Arctic Glacier is purchased. 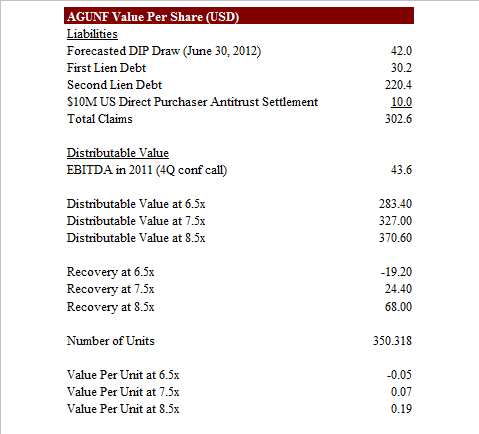 For example, if AGUNF is acquired, Reddy can issue pari first lien debt to finance the acquisition. If it isn't Centerbridge will convert $68.2M of First Lien notes into preferred stock of Reddy Holdings with a liquidation preference of $75M. In addition, Reddy stock holders are getting a 12 cent distribution with an additional 5 cents if AGUNF is acquired. "Reddy Holdings and Reddy Corp have been advised by Jefferies & Company, Inc. (“Jefferies”) with respect to the estimated value of Reddy Corp’s operations on a going-concern basis (the “Enterprise Value”). 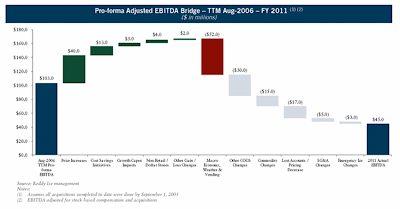 Jefferies has concluded that the Enterprise Value of Reddy Holdings and Reddy Corp, as of the assumed effective date of March 31, 2012 (as used in this Appendix E, the “Effective Date”), will range from approximately $382 million to approximately $434 million, with a midpoint of approximately $408 million." Reddy can pay a VERY high multiple for this business for the mere fact of the amount of synergies combining the two entities would entail. The amount of coverage the combined entity would have would be unparalleled. And we know that when AGUNF was marketed a few years ago, there were MANY bidders for the asset. The forecasted DIP draw of $42M: This business burns a ton of cash in the 1st and 2nd quarter of the year and generates a ton of cash in the 2nd half of the year. Just by cutting the DIP draw down to $20M gets your recovery at 8.5x to 26 cents a unit. Further the company has been WAY under budget in terms of DIP draws since the filing. So I am long (and have been since the filing). To me the biggest risk here is the presence of West Face as senior secured lenders. For those not in the distressed world, West Face are amazing investors that I frankly am afraid just want this thing for themselves. If they were not involved, I would make this a much larger position. 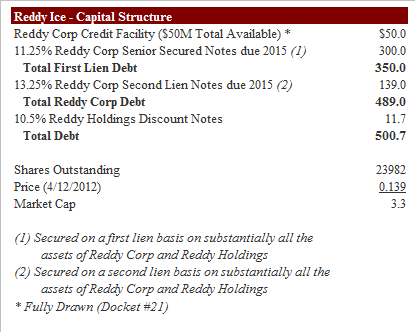 I'll keep everyone updated on both the Reddy Ice and AGUNF bankruptcy proceedings as they play out. According to Howard Marks, the discipline that is most important is not accounting or economics, but psychology. He started off with a quote from Yogi Berra, “In theory, there is no difference between theory and practice; but in practice, there is.” And this difference is what is at the essence of the human side of investing. Even though the business schools teach that the markets are objective and efficient, and generally follow the “Capital Market Line (CML) curve (“riskier assets always provide higher returns”), it was handily disproved in both contrasting time periods of Q2 2007 and Q4 2008. Essentially, the upward sloping CML does not work in practice. In practice, riskier assets must appear to provide higher returns, else they won’t attract capital. But that does not mean that those promised returns arrive in reality. If the risky assets provided higher returns, then they can’t be deemed risky after all. In Q2 2007 the risk premium was very inadequate, whereas in Q4 2008 it was overly excessive. The truth is that market is made up of people with emotions, insecurities, and foibles, and they often make mistakes. They tend to swing to erroneous extremes. One has to be very careful about the value and price relationship. If you buy without discernment to the price, the returns would be all over the place – sometimes good, and sometimes bad. In theory, people want more of something at lower prices and less of something at higher prices. However, in practice, people tend to warm to investments as they rise and shun them when they fall. In markets, the demand curve looks the opposite of how it looks in microeconomics theory based on supply and demand. The normal investor behaves like a pendulum with constant swings between optimism and pessimism, between risk tolerance and risk aversion. Although, the statistical “mean” location for the pendulum swing is in the middle, that happy medium is rarely seen in the markets, just as the pendulum spends almost no time at its “mean” during the swing. What is it that permits bubbles and crashes to happen frequently? Howard Marks pointed the reason to be failure of investor memory especially since when the investor’s memory is faced with greed/fear, memory loses. When people forget the past, they tend to repeat the same mistakes done previously. He recommended reading his latest memo, “Déjà vu all over again” in which he discusses contrarian signals. He went on to say that behaving pro-cyclically is one of the greatest, most frequent mistakes. We should strive to be anti-cyclical, but it requires strong memory and contrarian bent. He then referred to the memo he wrote 8-10 years back, “Us Versus Them,” describing two schools – the “I Know” school, and the “I Don’t know” school. He is a proud, card carrying-member of the latter. It is very important to understand the difference between the two schools. “I Know” school is confident about its forecast of the future, and “I Don’t Know” school is skeptical about that forecast. The former can only prepare for one outcome, whereas the latter hedges against uncertainty and prioritizes avoidance of losses over the maximization of gains. The latter approach is more likely to result in a successful investment career. Therefore, the motto at Oaktree is to “Avoid the losers; the winners will take care of themselves.” As long as the portfolios are built to avoid losers, they will do okay. Most of the times, investors think that only the most likely thing is going to happen and they really only prepare for just one outcome. Howard Marks doesn’t seem to think highly of economists as they do not draw ranges or probabilities of the forecasts they give out, and are more often than not proven wrong. He implored that while investing one should never forget the story of the 6 feet tall man who drowned in a stream which, on average, was five feet deep. It is not enough to know what the average outcome will be; instead one has to have an idea of the likely shape of the outcome distribution curve. One of the things investors should always be ready for is the unlikely disaster and should not ignore the “tails.” Unlikely things happen all the time, and the likely things do not happen all the time; we need to build our portfolios to account for that. This is not easy as Charlie Munger says, “None of this is easy, and if anyone thinks it is easy, he is stupid.” It is not easy in investing to make above average returns as most of the people do single scenario investing which ignores that more things can happen than will happen. The most likely outcome does not happen that often. And that is what Howard Marks thinks risk actually is. It is not standard deviation or volatility of returns; for him it is losing money. There are 3 ingredients for success in investing: aggressiveness, timing, and skill. If you have the first two, you don’t need the third. But that’s unlikely to remain the case in the long run as it is very hard to do the right thing, at the right time consistently in the investing business. He then went on to talk about the two twin imposters in investing: Short term outperformance, and Short term underperformance. They really don’t tell anything about an investor’s ability to outperform in the long run. He referred to the memo he wrote in 2006 after the melt down of the hedge fund, Amaranth, in which he dissects the events from his vantage point. He thinks that Amaranth’s problems didn’t start in 2006 when it went down a 100%; the problems started in 2005 when it went up a 100%. Going up or down 100% can be two sides of the same coin, and can be result of combination of sheer aggressiveness and luck/timing. If a person goes up a 100% one year, it does not guarantee that he will go up significantly again next year. He recommended reading the book “Fooled by Randomness” by Nassim Taleb, and understanding not only black swan phenomenon but also the concept of “alternative histories,” especially as it pertains to judging investors for the long term given that there is a lot of randomness in the world. Just because something should happen does not mean that it would happen. One of the things Howard Marks believes is that the correctness or the quality of a single decision can’t be judged by one outcome alone because of that randomness. One has to assess the decision-makers outcomes over a somewhat longer period of time to assess that person’s skill. Lastly he concluded by saying that forces that influence investors also push them towards mistakes. Investing in obvious things, things that are easily understood, things that are doing well, etc. – these are all easy to do. These things become names everybody wants to invest in. But just by that virtue, most of the times these assets become overpriced and unlikely to be bargains. Bargains that investors find in their lifetimes are likely to have hidden appeal, not be easily understood, and be unpopular. Things that appear hard to invest in are where bargains are found. Bargains do not appeal to herds. Any given asset can be a good buy or a bad buy depending on the price. There is no such thing as a “good idea” until you know the price. For each of the last two years, Distressed Debt Investing has covered Chicago Booth's Annual Distressed Investing and Restructuring Conference. We are always impressed by the content and quality of the speakers, and this year is no exception. The keynotes this year will be given by Jim Grant, of Grant's Interest Rate Observer, Jonathan Lavine, Managing Partner of Sankaty, and Jon Pollock, Co-CIO at Elliott. Like in previous years, the conference has panels with practitioners from every corner of the distressed debt world. The event will be held on April 13th at the University Club of Chicago. We will be there this year again, taking notes. We hope to see you there! ...and a few others. I will try to do a post on PNCL's bankruptcy (docket here: Pinnacle Docket) as well as giving summary of the above in the next few days. Stay tuned (while I try to stay above water! ).